Ancient natives living in central Arizona began building this impressive 5-story, 20-room dwelling in the 12th century A.D. It rests in a cliff recess about 100 feet above the valley bottom, close to Beaver Creek. 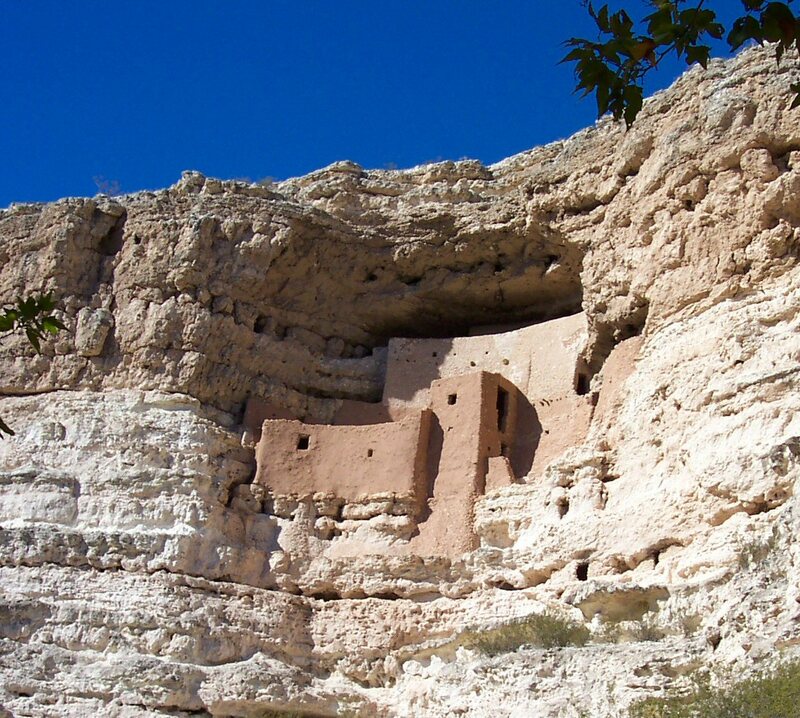 Early European settlers thought Aztecs built the structure and so called it Montezuma's Castle, but we know now that the earlier dwellers we call the Sinagua who are responsible for this well-preserved building. 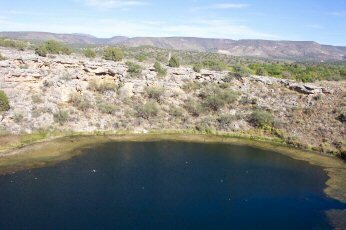 This is one of several sites in Arizona that preserves the Sinagua culture. 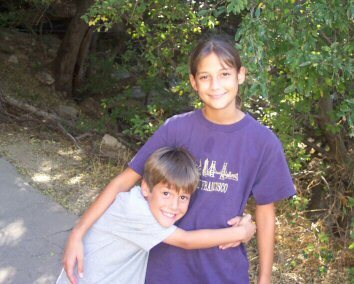 Other parks are Tuzigoot, Walnut Canyon, Wupatki, and Sunset Crater. The Sinagua took advantage of the reliable water of the creek to irrigate their crops. The canals they built are still visible today. By 1400 A.D. the Sinagua were abandoning their homes around the Verde Valley; scientists still speculate as to the reasons why. Perhaps there was a drought that forced them to move and be absorbed in pueblos to the north. 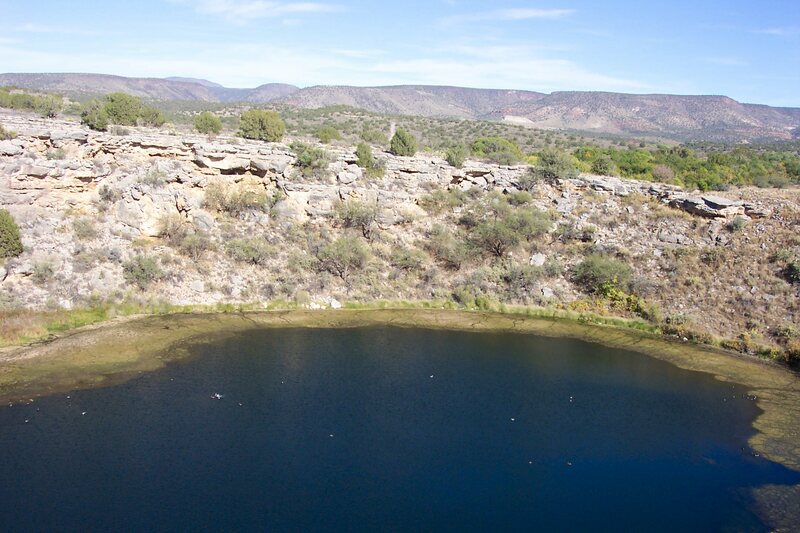 Montezuma's Well is a nearby lake that the Sinagua used to irrigate crops. Many aeons ago, a spring welled up from below ground and formed a cave in the limestone rock. As time passed, the cave expanded, until the walls could no longer support the weight of the roof and it collapsed into the water below. The resulting circular well is a welcome habitat for ducks and other wildlife. A well-preserved Sinagua structure rises before our eyes as we walk along a paved path. It's impressive, resting under a rock overhang beneath a sheer cliff. Visitors aren't allowed up into the rooms themselves, for they are too delicate. But the path gets us close enough for pictures, and to wonder how they climbed up there. Did they drag water up every day? Did they build up so high on the cliff to avoid enemies? Did their children ever fall off the edge? 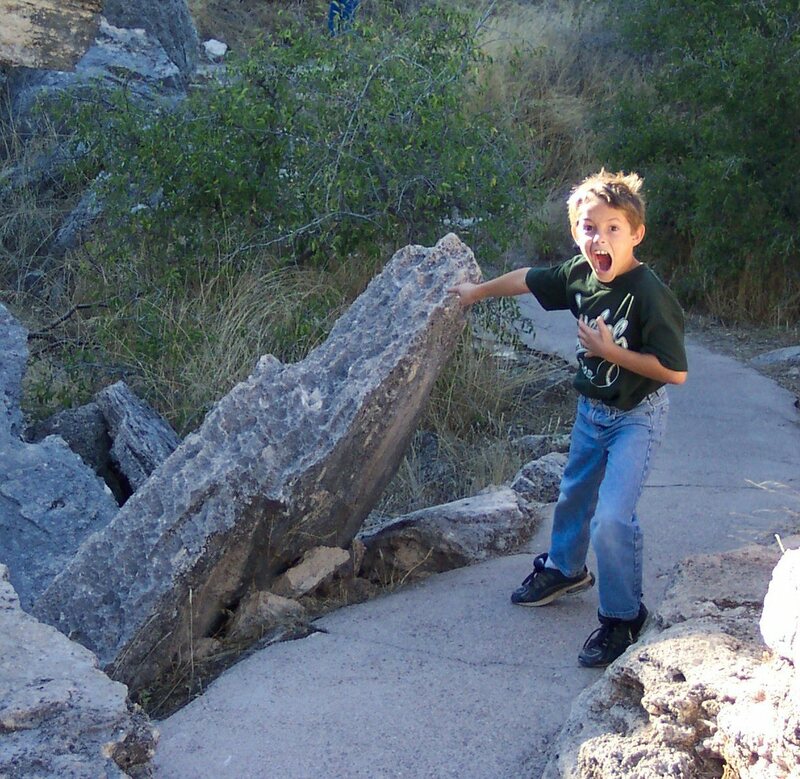 Montezuma's Well is a short drive away, and worth the trip. 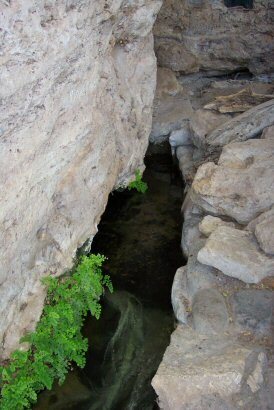 Visitors can hike down a path inside the well to see the flora and fauna close-up. Another path leads outside the well to where the spring slips through the porous limestone and comes out to join Beaver Creek below. The water is cool and refreshing. I enjoyed both aspects of this Monument. This was the first part I visited after buying the Passport, so it's the first stamp I have and that means a lot. The Castle, high up under the cliff, is very impressive, but the kids were disappointed that they couldn't scramble up to explore it. We enjoyed walking around the nature path, learing about the Sinagua culture and Arizona wildlife. As always, the Park personnel were cheerful and helpful with all our inane questions. I loved the Well also. Have I mentioned I'm a sucker for geologically interesting stuff? Well, I am. The hikes around the well were fun, and not too strenuous; my six-year-old had no problem. It was hot outside in the sun, but around the back of the well, where the spring emerged, it was fifteen degrees cooler and the water was nearly cold! From Phoenix, go north on I-17; from Flagstaff, go south on I-17. Take exit #289 and follow the signs north to Montezuma Castle. 85 miles to the southeast lies Tonto National Monument. Meteor Crater is 50 miles northeast. To the north, 40 miles away, is Walnut Canyon National Monument; 60 miles away, is Sunset Crater Volcano National Monument, and 80 miles away is Wupatki National Monument; 100 miles away is the border of Grand Canyon National Park. 20 miles to the northwest is Tuzigoot National Monument. 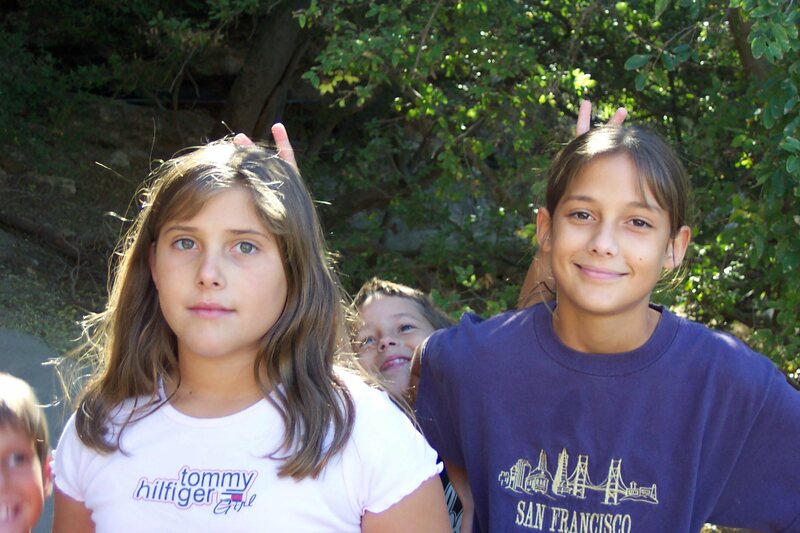 Visited December 2001, October 2003, and April 2004.